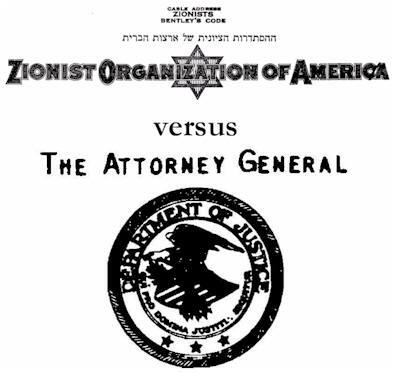 The Zionist Organization of America (ZOA), a U.S. subsidiary of the World Zionist Organization, was organized in Pittsburgh in 1918. The ZOA was invited by the U.S. Department of State to begin registering as the foreign agent of the World Zionist Organization immediately after passage of the 1938 Foreign Agents Registration Act (FARA). The ZOA refused, citing it was an American organization working to establish a Jewish homeland in Palestine, an objective supported by congressional resolutions. The ZOA cited funding flows to its affiliate organizations, rather than receipt of international funding. ZOA refused to register on the grounds that it did not receive any subsidies from the World Zionist Congress. In July of 1941, the Near East Division of the State Department again pushed for ZOA registration arguing that the ZOA was a subsidiary corporation despite the flow of funding. The State Department had sent an employee on an undercover visit to ZOA offices, determining it was an overtly political—as opposed to religious—organization and therefore not subject to the FARA exemptions available to religious entities such as the Vatican. The State Department found that ZOA was "subject to the direction" of the WZO and ordered the ZOA to register. ZOA again refused, stating that as a New York corporation is was merely an "affiliate" of the WZO. The US Department of Justice, upon taking over FARA enforcement, internally found that the ZOA was subject to registration, noting in June of 1943 that the "...threat of prosecution or actual prosecution by the Department of Justice for failure to register seems to be the only remaining effective action. But I doubt that such action would be warranted under the circumstances at this time..." In October, the OSS (intelligence agency precursor to the CIA) provided input on Zionist activities overseas indicating registration, but by November some Justice Department employees began detecting political pressure. "..the pressure was on somewhere in the government... it would be unwise to do anything further...under the circumstances do not desire for the moment to write to the Zionist Organization of America..."
On February 25, 1948 the DOJ issued another FARA order to the ZOA citing undue delays in responding to a matter "under consideration for some time." With US recognition of the state of Israel immanent, the Attorney General ordered that the registration question be delayed for 60 days. By May, frontline DOJ employees were hearing rumors that a high DOJ official privately told ZOA representatives that registration would not be necessary, and that they need not "fear prosecution. " Despite ongoing FBI reports of PR and political activities by the ZOA, the Justice Department agrees to quash the registration order if the ZOA alters some of its corporate articles defining relationships with the WZO. As noted by the head of the FARA section, the DOJ never actually confirmed whether the exonerating changes to the WZO/ZOA constitutions are ever made. Chapt_205_Law_1920.pdf 4/14/1920 ZOA is created by an act of the New York State Congress, Chapter 205 of the Law of 1920. 09061938_state_zoa_fara.pdf 9/6/1938 1st ZOA FARA notice from US State Dept. 09151938_state_zoa_fara.pdf 9/15/1938 State initially accepts refusal. 6111943_seek_regis.pdf 6/11/1943 DOJ decision to seek registration "unless some policy factor…"
6071944_doj_judge.pdf 6/6/1944 DOJ grants Levinthal right to file a brief. 01231948_dof_zoa.pdf 1/23/1948 4th FARA registration order - DOJ notes no response to 1944 inquiry, states registration required, no exemptions. 02191948_doj_zoa_meeting.pdf 2/19/1948 Conference at DOJ to hear ZOA requests for exemptions - denies, hears about negative membership implications, need to negotiate precise labeling of materials. 03091948flynn.pdf 3/9/1948 Internal DOJ memo: Let the matter rest until the matter of Palestine is settled. 03121948_memo.pdf 03/12/1948 Cover memo, DOJ orders hold on enforcement. 05271948_doj_fara_order.pdf 5/27/1948 6th FARA order to ZOA . 06021948_zoa_response.pdf 6/2/1948 "No necessity for further action..."
06021948_zoa.pdf 6/2/1948 ZOA letter referencing FARA exemption issued to Bartley Crum by AG. 06071948_files.pdf 6/7/1948 In discussions about registration order to Haganah Speaks, FARA section learns of a secret AG exemption given to Bartley Crum. an officer of both organizations "a couple of weeks ago...". 06221948_further_conference.pdf 6/22/1948 DOJ invites ZOA to conference about changes to constitution. 07011948_meeting.pdf 7/1/1948 DOJ meeting decides that past ZOA activities will not be subject to registration. 11081949_doj_fbi.pdf 11/8/1949 DOJ letter to FBI to stand down investigation of ZOA PR activities. 11191953_doj_fbi.pdf 11/19/1953 AAG Warren Olney advises FBI Director Hoover to forward any files on the ZOA pertaining to FARA status. 04261953_fbi_doj.pdf 4/26/1953 FBI director - citing no investigation - indicates no evidence in files on ZOA. 08011955_files.pdf 8/1/1955 File memo about ZOA and fact that it had not changed its constitution. 01291957_files.pdf 1/29/1957 FBI memo on Zionist attempts to recruit NAACP, vandalism of Arab flags at Lincoln memorial, Alan Dershowitz. 03071957_doj.pdf 3/7/1957 ZOA legal counsel seeks FARA opinion on changes to constitution. 11051958_doj.pdf 11/5/1958 DOJ briefs Attorney General for a meeting with the ZOA on the revived possibility it will register under FARA. 03031960_doj.pdf 3/3/1960 DOJ asks ZOA legal counsel about the status of FARA registration. These files were obtained from the US Department of Justice Records Group 60 held at the National Archives and Records Administration at College Park, MD via a Freedom of Information Act request filed on September 8, 2011. In accordance with Title 17 U.S.C. Section 107, this material is presented without profit for research and educational purposes, most importantly understanding how government functions during law enforcement actions involving Israel and its lobbyists. The Israel Lobby Archive has no affiliation whatsoever with the originator of the content nor is it endorsed or sponsored by the originator. Information appearing in [ ], hyperlink, or otherwise noted is provided to clarify events, identify individuals, or correct spelling. Non-Israel Lobby Archive hyperlinks are for additional reference information.